Ian Gillan has shot down a Deep Purple reunion with rocker Ritchie Blackmore, because he doesn't think the guitarist is great anymore. The longtime band frontman insists he gets along great with Blackmore, who was one of the founders of the Rock & Roll Hall of Fame group back in the late 1960s, but he doesn't want to perform with him. "I don't think Ritchie's playing great these days," Gillan said during a SiriusXM Town Hall radio chat on Tuesday (29Aug17), "and for that reason mostly, I don't think it would work." "We have invited each other to dinner a couple of times, but we haven't been able to make it, because I'm in London, he's in Long Island." Bandmate Ian Paice is also against a reunion with Blackmore, stating, "I enjoy going on stage every night knowing that I'm with my four friends and they're all gonna play every night. That wasn't always the case (when Ritchie was in the band), and I wouldn't want to go back to that again. "It's just the way the man is. He is a man of great emotions. He works it out in black and white; there's no grey areas to Ritchie... Sometimes your band members can't suffer from that, and I wanna go on stage and have fun. I don't wanna go on stage and come off feeling so down and miserable. I'm not prepared to go back on that route again." 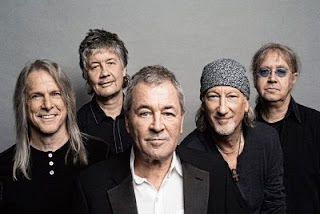 And Roger Glover, another longtime Deep Purple member, reveals he hasn't spoken to Ritchie for two decades, adding, "I don't think he approves of me very much, because of the remixes and the remasters that I did of the older albums. That's what I've heard anyway." Blackmore recently hinted he would like to play one last show with Deep Purple, claiming the band's manager had blocked him from joining them onstage at the 2016 Rock And Roll Hall Of Fame induction ceremony, according to Classic Rock.